There is a Gilmore Girls episode called "Luke Can See Her Face." For those of us who don't watch the show, here is a quick re-cap: Luke and Lorelai are great, great friends. GREAT friends. And everyone knows that they will eventually end up together as a couple (they do) but Luke is always scared to take the next step, what if she doesn't feel the same way? what if their great friendship is ruined? You get the idea. 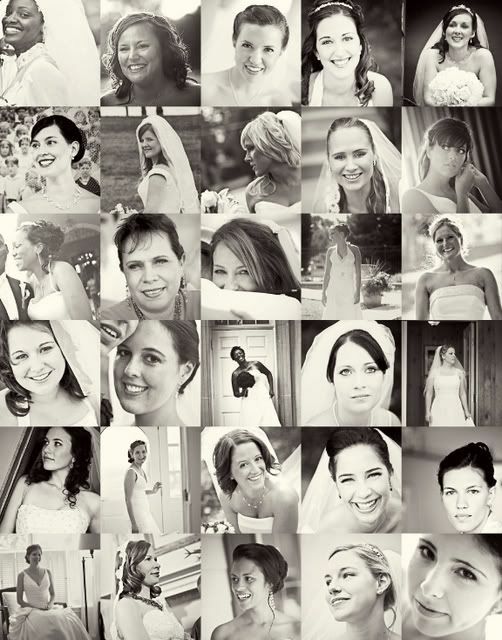 When I saw this again, I grabbed 30 pictures of the 30 brides. I have looked at this collage many times. You ladies all have 30 different stories, 30 different homes, 30 different pasts and 30 different futures. I love looking at your 30 different faces. And being a part of your 30 wonderful weddings. Oh, but you all are so much more then "faces." You have trusted me, befriended me, laughed with me, taught me and you also happened to hire me. Thank you from the bottom of my heart Hadiya, Cheryl, Beth, Hannah, Jennefer, Jennifer, Alycia, Heather, Brooke, Fayleen, Danielle, Kena, Val, Kate, Sarah, Kristen, Christie, Nia, Shaina, Mel, Brittany, Shanda, Colleen, Pami, Stephanie, Amanda, Angie, Tashia, Kristin and Debbie. Thank you, thank you THANK YOU! To quote Luke from the last line in that clip: "Whoa." Whoa. What a crazy, wonderful, undeserving year I had! God is so kind to me!